1981 marked the end of Drum Corps International's first decade and culminated with the first World Championships held out of the United States at the cavernous Montreal Olympic Stadium. While complications with PBS broadcasting from Canada were worked out for the following year's return to Montreal, the broadcast for 1981 had to originate from the DCI Midwest Finals in Whitewater, Wis., two weeks prior to the Montreal Finals. The biggest change in the drum corps activity that year was the advent of the grounded front ensemble percussion section, though not every corps took advantage of it. Many corps still marched mallet instruments around the field, but most did ground their timpani. This was the first of three years that Phantom Regiment brought out the "Spartacus" theme and the Cavaliers introduced "Softly As I Leave You." At the end, Santa Clara Vanguard would return home with its fifth World Championship title, finishing only 0.30 above the Blue Devils. Spirit of Atlanta placed 10th in Whitewater and moved up to 9th in Montreal. In 1980, Spirit placed 4th, just 0.80 from the Blue Devils' winning score. 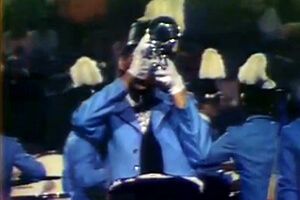 The opening fanfare of "Georgia On My Mind" returned from the corps' production in 1980. While the song was made famous by Ray Charles in 1960 and declared the official Georgia State Song in 1979, Hoagie Carmichel had written it all the way back in 1930. One of the criticisms leveled at Spirit that year was a visual program that was somewhat more static than other corps. That may have resulted in a Marching and Maneuvering General Effect score on the judges' sheets that was last of all finalist corps. As an example, in this opening fanfare, which started mellow and then hit big with screaming horns, the same form was on the field for the first full minute, rotating and then backing up. This was followed in the next tune by two groups of four-horn squads each rotating around the center and passing through the other group for 64 counts. Discount DVD offer ends Monday, Jan 28 at 8:30 a.m. ET.